In addition to residential improvement projects, we specialize in expansion and improvement solutions for the commercial sector as well. 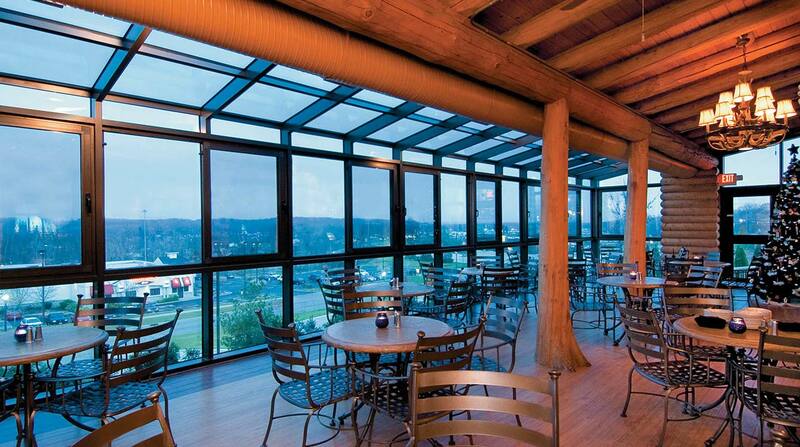 For over 20 years, we’ve custom- designed, manufactured and installed numerous commercial patio enclosures. 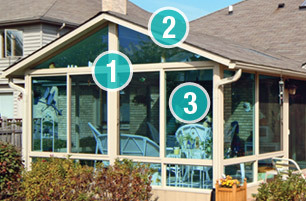 Our custom-designed solutions make your property more inviting - inside and out. 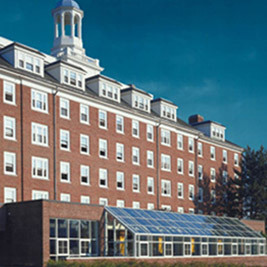 Companies and universities have utilized our commercial patio enclosures for restaurants, fitness centers, classrooms, conference rooms, atriums, reception areas, cafeterias, entryways, covered walkways, retail space, nursing homes, multi-housing space, museums, hotels and more. Our team offers the experience to meet the changing requirements of our industry and our turn-key approach often brings about ideas for value engineering, leading to cost effective alternatives. 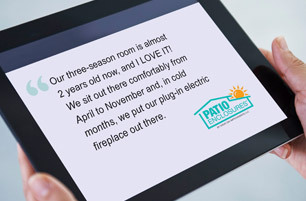 Whether your need is for a new space or part of a plan to renovate or expand an existing space, Patio Enclosures by Great Day Improvements will provide you the products and services to accomplish your goals. If your vision isn’t illustrated here, contact us! We would be happy to take a look at your commercial project and make recommendations. All of our products are specifically engineered in accordance with required local building codes. Being a custom manufacturer means no limitation to just “stock” sizes. 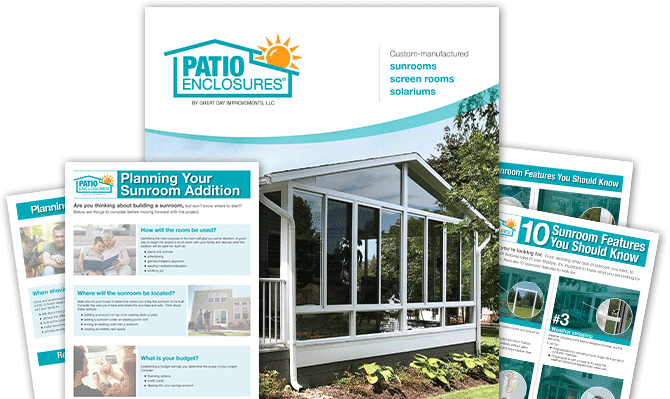 Patio Enclosures offers an unlimited array of shapes and sizes to meet the needs of your unique project. Utilizing our framing system allows us to create large open spaces and clear span, with no interior beams or columns. Also, several roof styles are available including our Comfort-Gard® glass roof panel system, which is an integral part of our aluminum foam-core roof. This patented system adds volumes of natural light to the space. We cut, temper and insulate our own glass systems and manufacture our own roof panels. With the addition of manufacturing our vinyl room, we offer the versatility and design flexibility to complete your project. Our patented integral railing system for our screen room is specifically engineered to be the cost effective way to enclose multi-story balconies to provide an open airy living space which can be enjoyed free from insects and inclement weather. Over the years, we’ve successfully completed projects for the following organizations, just to name a few: Nike IHM, McDonald’s®, Marriot Corporation, Tufts University, Subway®, Manhattan College, Ripley’s Entertainment, Wendy’s International, Tumbleweed Restaurants, Caron Foundation, Presbyterian Homes, Cargill, Kraft Foods, Nestle USA, Chammps Entertainment, Parker Aerospace, McCormick & Schmick’s, Veterans Administration and Navy Public Works. Our straight eave commercial patio enclosures utilize a single-sloping glass roof surface that transitions sharply from the roof to the front panels. This versatile design can accommodate variations in the pitch, or angle of the roof. Our glass enclosures create beautiful light-abundant and energy-efficient spaces for your guests, customers and faculty to enjoy. Select from a variety of glass and framing options including our new wood grain finishes. To learn more, schedule a design consultation. 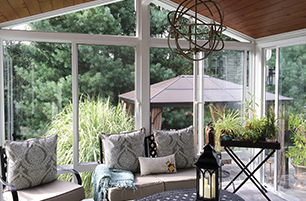 As pioneers in the sunroom industry, we are constantly pushing the advancement of manufacturing and engineering of our products. We are always up for an architectural challenge and have developed specialty applications for various projects over the years. 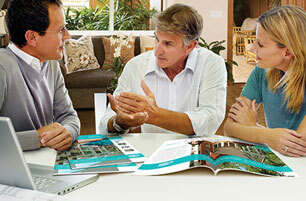 To learn more or to discuss your unique project, schedule a design consultation. 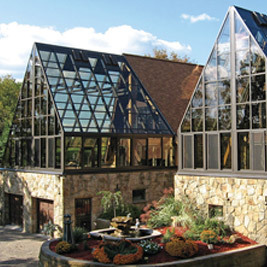 We excel in creating multi-story applications of sunrooms and screen rooms. Sunspaces are highly desired by purchasers of condominiums, senior and adult communities and other multi-housing buildings. 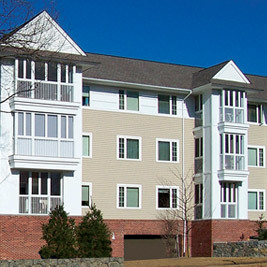 We’ve developed a patented integral railing system that is ideal for mid- to high-rise complexes providing safety and security while allowing residents to enjoy the outdoors free from the threat of insects and inclement weather. Over the years, we’ve worked closely with builders and developers of new construction to create extraordinary spaces that fit perfectly into the overall design. These are just some examples of the types of multi-story sunrooms and screen rooms we've created for various builders and developers. Let us know how we can create a solution for your project by scheduling a design consultation.